Humanity's long-held dream of putting boots on Mars may become reality soon. A number of organizations, both public and private, are drawing up plans to send astronauts toward the Red Planet, whose allure as an otherworldly destination and potential host of alien lifehas beckoned scientists and dreamers for hundreds of years. Here's a brief rundown of five of the most prominent possible crewed Mars missions, starting with an ambitious effort that aims to launch less than five years from now. The nonprofit Inspiration Mars Foundation plans to launch two people, preferably a married couple, on a flyby of the Red Planet in January 2018. The pair won't touch down on Mars but will zoom within 100 miles (160 kilometers) of its surface in August of that year before heading home to Earth. The Netherlands-based nonprofit Mars One also has its eyes on the Red Planet, though this group aims to establish a permanent colony there. 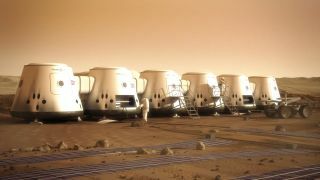 Mars One hopes to land four astronauts on the Red Planet in 2023, at an estimated cost of $6 billion. The group plans to foot most of the bill by staging a global media event around the entire enterprise, from the astronaut selection process to the pioneers' time on Mars. There are no plans to bring these first four settlers — or any of the additional colonists that Mars One aims to launch every two years or so — back to Earth. Still, more than 200,000 people threw their hats in the ring during Mars One's 19-week application window, which closed Aug. 31. Billionaire entrepreneur Elon Musk — founder of the private spaceflight firm SpaceX and CEO of electric-car company Tesla — has always dreamed big, so it's no surprise that he has his eyes set on Mars. In fact, Musk has said repeatedly that he established SpaceX in 2002 primarily to help humans become a multiplanet species. And in November 2012, he announced a broad outline of how to make it happen. Musk envisions launching colonists to the Red Planet aboard a huge, reusable rocket powered by liquid oxygen and methane, for about $500,000 per seat. The Mars colonywould begin with a small group of pioneers — perhaps 10 people or so — but would eventually grow into a self-sustaining settlement perhaps 80,000 strong, he said. The key to such an ambitious effort is developing a fully and rapidly reusable rocket, Musk has said. And SpaceX is putting a lot of effort in this area, launching increasingly ambitious test flights of a reusable prototype called Grasshopper and attempting to make a soft water landing with the first stage of its upgraded Falcon 9 rocket during a launch out of California in late September. This plan, first developed in the 1990s by Mars Society head Robert Zubrin, urges a live-off-the-land approach in order to keep the costs of a Red Planet colonization effort reasonable. Over time, the settlement would become more and more self-sufficient, relying less and less on expensive resupply trips from Earth. Getting astronauts to Mars is the main long-term goal of NASA's human spaceflight program. The agency is currently working to send humans to a near-Earth asteroid by 2025, and then to the vicinity of the Red Planet by the mid-2030s, as instructed by President Barack Obama in 2010. "The vicinity of Mars" is rather vague and broad, so NASA may aim to meet the deadline with a crewed mission to Mars orbit or to one of the Red Planet's two tiny moons, Phobos and Deimos. But the space agency does want to put boots on the planet eventually, for both scientific and exploration purposes. NASA has landed increasingly sophisticated robots on Mars over the last 15 years, with the most recent being the 1-ton Curiosity rover, whose observations indicate that the Red Planet could have supported microbial life billions of years ago. But actually finding convincing evidence of Martian life, if it ever existed, may be a tall order for a robot millions of miles away from its human handlers. The job, many experts say, would best be done by scientists on Earth examining a returned Red Planet sample or astronauts studying such material on the surface of Mars.